Rwanda Development Organisation is a non-government Organisation founded by Rwandans in 1995 as a non-profit making organisation.It has a vision of sustainable development for the Rwandan community who have to enjoy a good standard of living with the ability to satisfy their basic as well as secondary needs. Rwanda Development Organisation (RDO) has received funding from TROCAIRE to support the Rwanda Climate Change and Development Network (RCCDN) wich has been identified as a solution to ensure the coordination of the CSOs toward efficient engagement with policy makers at all levels. The network has 26 founder members non-government organisations and brings together civil society organisations working in different sectors having a direct link with the climate change and related disaster risk management from the community level up to the national level. To promote the climate change awareness and the Rwanda Climate Change and Development Network (RCCDN) visibility, it is planned that RCCDN produce different user friendly IEC materials that will be used for that reason. The Rwanda Development Organisation (RDO) would like to hire a professional firm in printing of different materials for disseminating information, educating community members and facilitating communication in and out of the Rwanda Climate Change and Development Network. It is estimated that the service will be provided over a period of two weeks from the contract signing date. The printing house will propose fees in Rwandan francs and VAT will be deducted at source as per RDO’s policy. Interested companies that meet the required criteria shall submit their technical and financial offers in sealed envelopes addressed to the Executive Secretary, Rwanda Development Organisation (RDO), KK500 BRALIRWA Road, P.O. Box 368, Kigali. Envelopes clearly marked “ PRODUCTION OF RCCDN USER FRIENDLY IEC MATERIALS THAT PROMOTE CLIMATE CHANGE AWARENESS AND RCCDN VISIBILITY “. should be submitted to RDO secretariat offices not later than 5th September 2018 at 3:00 P.M. Only selected candidate will be notified. Done at Kigali on 25th August 2018. Farmers from Eastern Province are appealing for support in combating crop diseases caused by climate change effects which has triggered loss of harvest in the recent agricultural season. Abdallah Ntuyenabo, 32, is a farmer from Mukarange sector in Kayonza district, one of the Eastern Province’s Districts. He is among many farmers in the district who are starving due to drought and crop diseases that reduced the yield of beans, cassava, maize and sweet potatoes. He told The Inspirer that the beans were affected by a new crop disease called “ibenja”, a Kinyarwanda name and its impact on the bean plant makes it withered from early stage after germination. The father of three said he sometimes loose a half of expected yield because of this issue. “For the last season A, where I expected to harvest 100 kilogrammes of beans, I got only 50 kilogrammes and sometimes I even get 20 Kilogrammes. This was due to this disease and a long lasting drought,” Ntuyenabo said. He said at the moment there is no pesticide or any other solution to the issue as agronomists did not also find any solution for this. He noted that heavy rainfall also damaged crops. He noted that the disaster effects have led to increased prices at the markets where a kilogramme a kilogramme of beans sold at Rwf300, while it should be at least Rwf200 during the harvest period. Not only in Rwanda or in the region, climate change issues also consist of a global issue that deserves much attention as a number of people are facing effects of disasters resulted from the issue. Civil societies say the issue should be addressed through joint efforts and improved policies and citizen’s mobilization about the climate change, its cause and mitigation strategies to avoid its side effects on human beings, environment and livestock. In March 2018, disasters include floods left a number of damaged crops and infrastructures such as roads and bridges as well as the loss of lives of people and livestock. All of them are the effects of climate change occurred so far. Hunger crisis is also one of the effects of climate change as many African countries including Rwanda are now facing crop diseases and prolonged drought during the sun season. In Rwanda, the issue is dominant in Eastern Province where the citizens from most of the districts in the area are prone to climate change effects, especially drought. Lilian Umukunzi from Right-Left among the Civil Societies advocating for climate change issues told The Inspirer that her voice will make changes in helping the community to adapt to Climate change effects. (Elias Hakizimana). 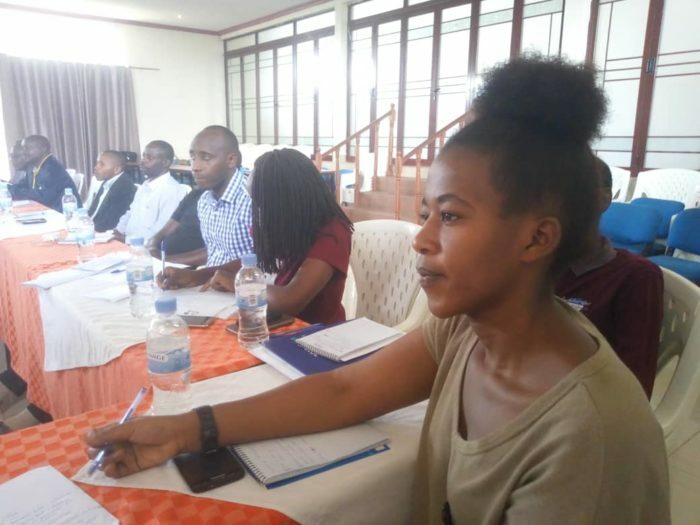 RCCDN organized a three-day-training of trainers for Rwandan’s Civil Societies on climate change issues to better serve the community diligently. Not only in Rwanda or in the region, climate change issues consist of a global issue that deserves much attention as a number of people are facing effects of disasters resulted from the issue. RDO launched RCCDN (Rwanda Climate Change and Development Network) strategic plan of 2018-2022. Rwanda Climate Change and Development Network (RCCDN), a network consisting of different Civil Society Organisations operating in the country, has offered $3.5 million (about Rwf3 billion) to support climate change resilience programmes. Supported by international development organisation, Trócaire, the funds will go to develop different programmes like environment conservation, irrigation, tree plantation, rain water harvesting and providing timely information about climate change to the population among others. RCCDN Chairperson, Eugene Rwibasira said that climate change is a matter of concern for both the country and the world. “Climate change is a boundless issue and is not the particularity for Rwanda but it is global. We can’t say that it is going to be terminated today, but we want to tackle it by focusing on prevention measures to minimise effects,” he said. “We shall raise people’s awareness about climate change, construct infrastructure, invest many efforts in irrigation, plant trees all around as well as encouraging population about forest conservation,” he added. The Director General of Environment and Climate Change, Juliette Kabera said that climate change is among the issues of concern to Rwanda. “Rwanda’s economy is largely based on agriculture and animal resources, sometimes the country suffer prolonged droughts or heavy rains which cause erosion and destroy many things. So, the government welcomes this network that will help face these effects,” she said. She hailed the programme through which farmers will change mindsets and use reliable information about good planting season. RDO organized the first Rwanda Climate Change and Development Network General assembly, that brought together fifty-five participants. Rwanda Development Organization (RDO) organized the first Rwanda Climate Change and Development Network General assembly, that brought together fifty-five participants. The meeting was meant to agree on the network’s constitution and adopt it. It was also meant to contribute to the development of the network’s strategic plan 2018-2022. In his Opening remarks the Executive Secretary of RDO, Mr. Rwibasira Eugene, reminded the participants on how the idea of establishing the Rwanda Climate Change and Development Network came about. He thanked TROCAIRE for the support given through RDO as the host organization to establish and strengthen the network. He introduced the Assistant Coordinator, of the network Donatha Nibagwire who was recruited to support the network Coordinator. He wished all participants fruitful deliberations as they discuss on the constitution and the strategic plan, and the elections of the Board of Directors, Audit and Conflict Resolution Committees. After opening remarks made by the RDO Executive Secretary, the Coordinator made a presentation of the constitution. The draft constitution had been distributed three weeks in advance and members had enough time to go through it. After the presentation, participants started discussing and agreeing article by article. All articles were agreed on and the constitution adopted. The network’s logo was also adopted after analyzing the three samples that were presented. After adoption of the constitution, the next item on the programme was to elect office bearers. This agenda item was shifted and made the last programme item to be carried out after making contributions to the strategic plan. The consultant working on the development of the strategic plan made a presentation before participants broke out into three working groups to generate viable input into the network’s strategy. The groups later made presentations before the plenary and discussions went on to ensure effective contributions. All the contributions were submitted to the consultant who was tasked to integrate them into the strategic plan. The consultant was advised to do further consultations with other stakeholders including government institutions and development partners. Participants in the General Assembly agreed that the Consultant Gasafari Mpabuka Willy be the returning officer. Two among the participants who were not eligible to vote were also requested to support the returning officer. Voting was conducted by secret ballot as per the adopted constitution. Nominated candidates were given time to confirm their nomination and willingness to serve. a) 48 Founder Member Organizations present at the General Assembly Meeting adopted the Rwanda Climate Change and Development Network constitution. Serious discussions focused on the name of the network, its vision, mission, objectives and core business among other things. b) Members present at the GA made incredible contributions to the network strategy 2018-2022. The GA meeting participants expressed satisfaction with the arrangements of the meeting. They appreciated the role played by RDO as the initiator and TROCAIRE as the funding partner. They were happy that the meeting set objectives and outcomes were all met and drew recommendations that should be worked on. i. That the legal registration process of RCCDN commence with immediate effect. iii. That the Strategic Plan be subjected to review by the Steering Committee members and two additional members appointed.